62 Commonwealth is located on the south side of Commonwealth, between Berkeley and Clarendon, with 60 Commonwealth to the east and 64 Commonwealth to the west. 62 Commonwealth was built ca. 1872, one of three contiguous houses (62-64-66 Commonwealth). The three houses form a symmetrical composition, with 64 Commonwealth, in the center, a full story higher with a tall mansard roof ornamented with iron cresting. 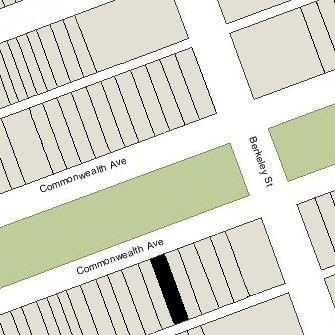 The flanking houses at 62 and 66 Commonwealth are mirror images of each other. Horizontal string courses of stone unify the façade. Click here for an index to the deeds for 62 Commonwealth. On April 1, 1873, 62 Commonwealth was purchased from Henry Bigelow Williams by George Lee Ward, He and his wife, Caroline Pepoon (Jenkins) Ward, made it their home. 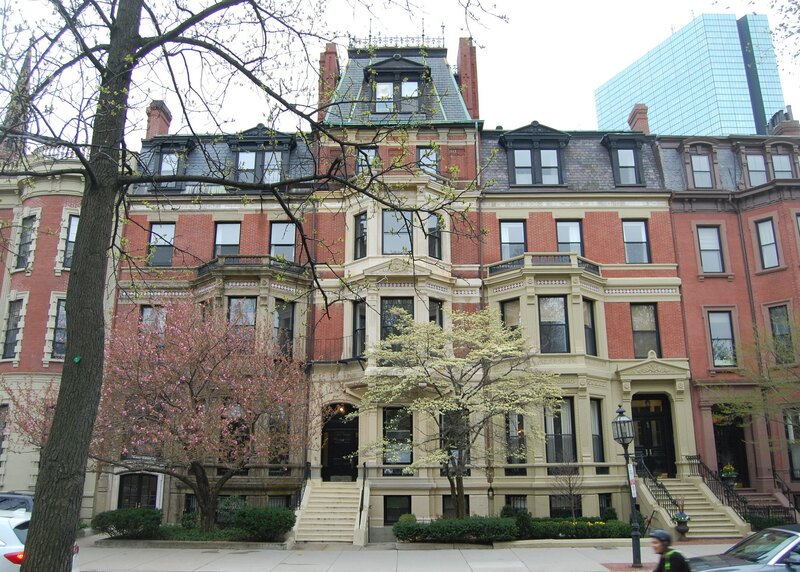 They previously had lived at the Hotel Hamilton at 260 Clarendon, owned by Henry Bigelow Williams. George Ward was treasurer of Lewiston Mills, owners of cotton mills in Lewiston, Maine. The Wards continued to live at 62 Commonwealth during the 1880-1881 winter season, but moved thereafter to the Hotel Vendôme. On December 23, 1880, the Massachusetts Hospital Life Insurance Company foreclosed on its mortgage to Henry Bigelow Williams, which George Ward had assumed when he acquired 62 Commonwealth, and took possession of the property. On January 22, 1881, 62 Commonwealth was acquired from the Massachusetts Hospital Life Insurance Company by William Storer Eaton. He and his wife, Frederica Warren (Goddard) Eaton, made it their home. They previously had lived at 17 Louisburg Square..
William Eaton had been a shipping merchant in the Calcutta trade. He later was a founder of the National Tube Works, subsequently serving as president and then treasurer of the firm. The Eatons’ three children — William Storer Eaton, Jr., Georgiana Goddard Eaton, and Francis Storer Eaton — lived with them. Francis Eaton moved in about 1889. Frederica Eaton died in February of 1894, and on March 5, 1894, William Eaton transferred 62 Commonwealth to their daughter, Georgiana Eaton. William Eaton continued to live at 62 Commonwealth with his daughter. His son, William, also lived with them. He was president of the Boston Blower Company, manufacturers of fans and blowers. William Eaton, Sr., died in June of 1902 and William, Jr., moved soon thereafter to the Hotel Carleton at 160 Longwood. 62 Commonwealth remained Georgiana Eaton’s home until her death in September of 1911. On November 8, 1911, 62 Commonwealth was purchased from the estate of Geogiana Eaton by George Alexander Philips Duncan, an engineer. A widower, he and his wife, Laura (Dove) Blanchard Duncan, had lived at 8 Gloucester until her death in August of 1910. In June of 1918, George Duncan became the 4th Earl of Camperdown of Lundie upon the death of his brother, Robert. Thereafter, his surname became Duncan-Haldane. He continued to live at 62 Commonwealth until his death in December of 1933. The house was not listed in the 1935-1937 Blue Books and was shown as vacant in the 1935 Boston City Directory. On November 21, 1934, 62 Commonwealth was acquired from the estate of George A. P. H. Duncan by Mary L. McGill of Somerville. She also owned 24 Commonwealth and 26 Commonwealth, where she operated lodging houses. On November 1, 1935, 62 Commonwealth was acquired from Mary L. McGill by George B. Rittenberg and S. Clifford Speed, trustees of the Clifford Realty Trust. 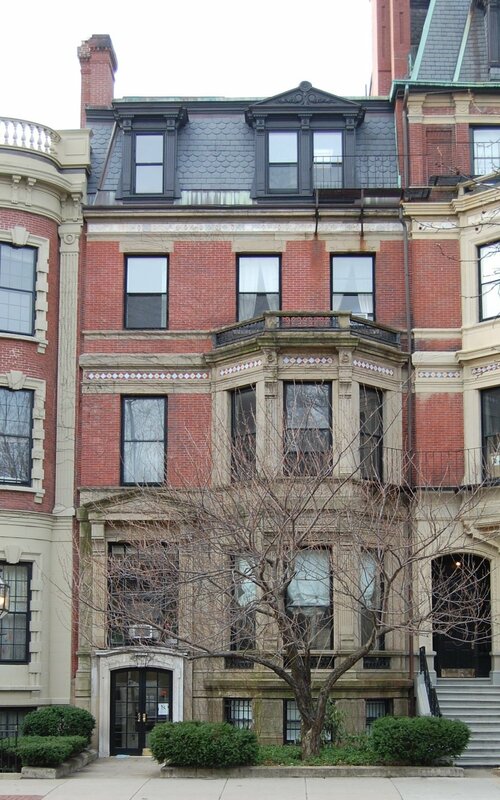 George Rittenberg was a lawyer and Shirley Clifford Speed was a real estate dealer who converted many Back Bay houses into lodging houses and apartments. On the same day, they also acquired 24 Commonwealth from Mary McGill, and in November of 1936 they acquired 26 Commonwealth from her. 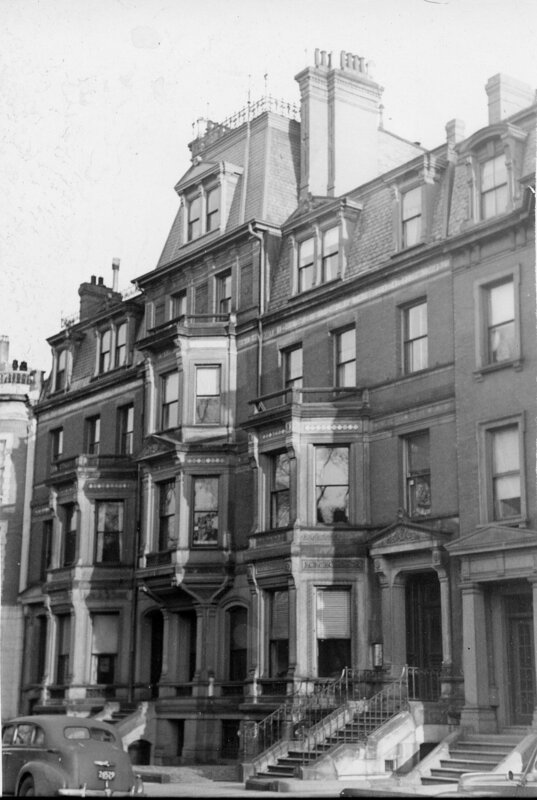 George Rittenberg and S. Clifford Speed operated 62 Commonwealth into a lodging house. On October 31, 1945, 62 Commonwealth was acquired from George Rittenberg and S. Clifford Speed by real estate dealer Howard Stephen Cosgrove. In November of 1945, he filed for (and subsequently received) permission to remodel the house from a single-family dwelling into nine apartments. On December 29, 1954, 62 Commonwealth was acquired from Howard Cosgrove by Peter Philip Silversmith. He and his wife, Beatrice (Miller) Silversmith, lived in Brookline. He was a real estate dealer and lawyer, and also was manager of the Columbus Arms Hotel at 455 Columbus, where he was the victim of a robbery on April 26, 1955. By 1956, the Silversmiths had moved to an apartment at 62 Commonwealth, where they continued to live in 1957. They then moved to Palm Beach, Florida, and also maintained an apartment at 326 Dartmouth. On May 14, 1960, 62 Commonwealth was acquired from Peter Silversmith by Lenk Properties, Inc., and on March 15, 1961, it was acquired from Lenk Properties by Eric Oddleifson and Robert A. G. Monks, trustees of the Oddlo Realty Trust.